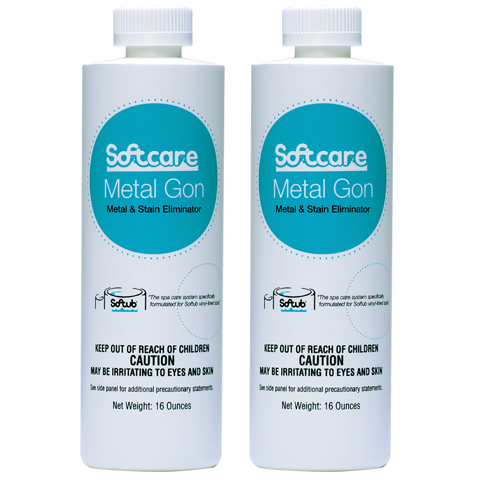 Softcare Metal And Stain Eliminator. Buy Two And Save 15%! Metal Gon suspends and neutralizes mineral elements that can stain and corrode your Softub spa. 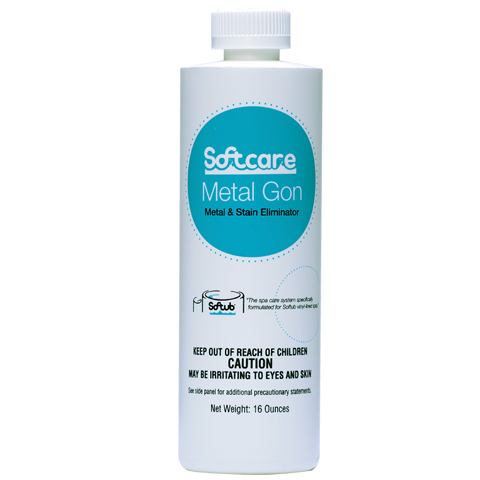 Metal Gon is a concentrated product that suspends and neutralizes mineral elements that can stain and corrode your Softub spa. Metal Gon also acts as a clarifier to cluster unfilterable microscopic minerals together so that they can be removed in the filtration process. When Filling The Spa: Add 16 oz. to spas containing 500 gallons of water before any sanitizer is added. Add 5 ounces for Softub T-140, 7 ounces for Softub T-220, 10 ounces for Softub T-300. Remove and clean cartridge filter within 24 hours. Draining and cleaning of the Softub spa is recommended every 3 months. Tip: As you refill the water in your Softub, Metal Gon will coat the sides of your tub so that calcium deposits won’t stick. Maintenance: If fresh water is frequently added due to evaporation or bather activity, you may need to add extra Metal Gon. Add 1 oz. per 100 gallons to hot tub water while the pump is running. Allow the water to circulate overnight or until the water is clear. This will help to control any mineral staining and will help to protect the heating element from corrosion. If staining continues due to excessive mineral levels in water, increase dosage. Avoid contact with skin, eyes, or clothing. Skin Contact: Wash thoroughly with cool water for 15 minutes. If irritation develops, call a physician.